Most people don’t understand the difference between an inverter generator and a conventional portable gas generator so we put together this comprehensive article answering the common question : What is an inverter generator? We understand it can be confusing to make sense of the technical aspects of generators so we hope this guide answers your questions, such as : Advantages and disadvantages of an inverter generator, how an inverter generator works and much more. We hope you find this a useful resource on inverter generators. We feel that education is important so we always do our best to keep our readers and informed. With any new technology, people can become easily confused with the terminology and applications associated with them. Inverter generators haven’t been around very long so, understandably, people want to know more about them. This article is intended to answer all your questions surrounding this relatively new technology. What is an inverter generator? How does an inverter generator work? What are the advantages and disadvantages of an inverter generator? Let’s start at the beginning…with this video from Champion (an excellent brand) : What is an inverter generator? The basic function of an inverter is to change Direct Current (DC) into Alternating Current (AC). The simplest way to do this is by using a simple switch mode. A DC power source is directed to a switch that opens and closes in order to change the polarity of the current. Each side of the switch is connected to a field conductor, simply put, this a circuit (usually a copper coil) that generates an electric field around it. Each of these fields creates a point to which the power can alternate and is then supplied to transistors that direct the current as a pulse to a final output at the desired frequency. The speed at which the current pulses creates a frequency, in other words, how many times the power is switched per second. Standard US power operates at 60HZ and therefore the transistor will swap polarity 60 times per second. This system of switching uses what is called a Metal Oxide Semiconductor Field Electric Transistor (MOSFET). At least two MOSFETs are used in parallel mode to create a peak and trough of the sine wave. This switch mode produces a very basic representation of a sine wave known as a square sine wave. Two points are created by either side of the switch, creating a square shape when these points are joined. This type of sine wave is not very efficient and some equipment will not function properly on a square wave. By adding more MOSFETs in parallel, multiple square waves are produced to create a stepped square or modified sine wave. While this is not a true sine wave, it works very similarly to one and allows almost all AC equipment to operate normally, though not always as efficiently as a true sine wave. Larger capacity switch mode inverters will use thyristors to handle the higher current. The problem with square and modified sine waves is that one cannot control the harmonic distortion of the wave. What is Harmonic Distortion (HD)? Just like sound, alternating current moves in waves and both of these wave types can become distorted. We are familiar with sound wave distortion because we can hear it when the amplifier becomes overloaded or there is interference with the signal. Electric sine waves experience the same distortion, only we cannot see or hear it. It does, however, affect the way electric equipment functions. Harmonic distortion can cause electric motors to be less efficient and overheat. HD is most detrimental when it comes to electronic equipment. Electronic equipment that uses a microprocessor are affected by HD in that it changes the way they perform and it generates excessive heat. Repeated exposure to HD will damage the circuitry of this type of equipment. Eventually causing them to fail. Microprocessors are common in many household devices from computers, phones, and TVs to many kitchen and other household appliances. It is, therefore, becoming increasingly important to ensure that we use “clean” power with low HD. All AC power will experience some degree of distortion. Engineers measure the amount of harmonic distortion over a continuous sine wave as Total Harmonic Distortion (THD). A THD of less than 3% is considered to be clean power. Even grid power can sometimes exceed the 3% threshold but this happens very seldom because grid power uses large generating capacity. A portable generator does not have the same capacity and the THD can fluctuate greatly as the load demand changes. As a result, standard gas generators will cause damage to electronic equipment over time. Modern inverters use Insulated Gate Bipolar Transistor (IGBT) technology to create a near-perfect sine wave. The sine wave produced by IGBTs is far superior to MOSFET inverters as they create many more points or steps. In addition to this, pulse width modulation is used to control the sine wave and limit the THD. The result is a clean pure sine wave, suitable for use with the most sophisticated electronic equipment. Capacitors are also used to compensate for changes in DC voltage, thereby maintaining a stable output voltage. Because modern inverters are able to produce a sine wave that is even better than standard grid power, the double conversion system was introduced for very sensitive electronic equipment. Double conversion refers to a system that converts an AC power supply to DC and then uses an inverter to convert the power back to AC. The point of using this technology is to produce a sine wave that is more reliable than the original source, with very low THD (sometimes less than 1%). This technology was originally developed for use in laboratory and aviation equipment that require a perfect sine wave to maintain calibrations set for very accurate measurement. The double conversion system is what is used in inverter generators. Standard gas generators have been around for a long time and use very basic technology. A gas engine is used to run an alternator that produces AC power. A governor controls the amount of fuel supplied to the engine to keep it running at a constant speed (usually 3600 RPM). As the load is increased, more power is needed to keep the alternator running at the same speed. The governor will open to supply more fuel as more power is needed, very much like pressing down on the accelerator pedal of a car to keep the speed constant when you approach a hill. A governor is not 100% accurate and there will be changes in alternator speed causing both the voltage and frequency of the current to change. Many modern generators use an Automatic Voltage Regulator (AVR) to keep the voltage relatively stable. They cannot, however, control the frequency changes and generators are therefore prone to quite high levels of harmonic distortion. By using a double conversion system, an inverter generator is able to correct this and the inverter produces a very clean sine wave with low HD. By now it’s clear that an inverter generator is beneficial for use with electronic equipment as it will prevent harm caused by harmonic distortion. Another benefit of using a pure sine wave with low HD is that all electrical equipment running off the generator will work more efficiently and therefore use less electricity. This means that an inverter generator will run longer on a single tank of gas. Inverter generators can also incorporate parallel functioning. This means that more than one generator can be used together to increase the power output. It’s possible to include technology that synchronizes the sine waves of two or more generators so that they can function as one. This means that you will be able to draw the total wattage of all these generators combined. Not all inverter generators have the ability to run in parallel, but those that do, have the versatility of being able to link two or more of the same type of generator to increase the output. Some generators use technology that lowers the engine revs when power demand decreases. This saves fuel. The problem is that a delay in increasing the revs as demand increases will change the AC frequency. An inverter will compensate for this frequency change, making it feasible to change the revs without affecting the power output in any way. This further increases the efficiency and therefore improves fuel consumption. Because inverter generators are the latest development in generator technology, the design of the generator itself is usually more advanced. They generally use very fuel efficient engines and often run much quieter than older designs. They are also very lightweight, making them ideal for people who are looking for a portable generator that’s easy to transport. So, essentially an inverter generator protects electronic equipment and works more efficiently to save on fuel consumption. There’s also the added benefit of being able to use more than one generator in parallel, where this function has been used in the inverter design. The only real disadvantage to inverter generators is their price. They are more sophisticated than standard gas generators and you will be paying more for this added technology. For some, the more complex technology may be a problem. While inverters are maintenance-free and are very reliable, they are not easily repaired by an inexperienced technician. For the DIY owner who is used to repairing their own generators, repairing an inverter generator will prove to be more complicated. Though I don’t see this as a big problem because most people have their generators repaired and serviced by a professional and one hardly ever encounters a problem with the inverter. Because they are usually designed to be as small and light as possible, the fuel tank is often smaller than those found other generators. Even though this video promotes Yamaha products it still provides some useful information that helps you understand what an inverter generator is. Inverter generators are usually smaller machines and are therefore more suited to recreational use like camping and on yachts or where ever you need a small portable generator. However, models that are capable of parallel connection can be used for larger applications where more power is needed, by using more than one generator to increase the total current output. Anyone who is using electronic equipment regularly with electricity supplied by a generator should consider this option. The extra cost of acquiring and inverter generator far outweighs the cost of replacing damaged equipment as a result of bad power supply. Inverter vs Generator : What’s the Difference? If you’re interested in learning about the major differences between inverter generators and conventional generators then you should go and read our comprehensive article entitled : Inverter vs Generator? : What’s the difference between an inverter generator and a conventional generator. It will clear up any remaining questions you have about choosing the right generator. If you think that an inverter generator is the best option for you, your next step is to find the best inverter generator to meet your needs. In this section, we’ll be reviewing three models that offer the latest technology for a very reasonable price. Can power a variety of electrical devices, including: Lights, laptop, radio, modem/router, fan, TV, microwave, refrigerator. Can even run 1 or 2 small power tools. Can safely power sensitive electronics. This little generator produces a lot of power for its size, 2800W running power with a 3100W peak load ability. The generator uses a 171cc four-stroke OHV engine with EPA and carburetor, certified for emission levels in 50 states. The advanced design of the engine and muffler means that it runs incredibly quietly at only 58dBA, measured from 23 FT away. This noise level means that even if you’re quite close to the generator you can conduct a normal conversation without raising your voice, a very big advantage for campsites. It also has a USDA approved spark arrestor as one of its many safety features. Overload protection is automatic so there’s no need to reset a breaker after it trips due to an overload. The power will reset itself when the load returns to normal. It also has an automatic low-oil shutoff to protect the engine. A wireless remote that operates from up to 80 FT is a big advantage. There’s no need to go outside when it’s raining or after dark to switch the generator on or off. It has an electric and recoil starter. 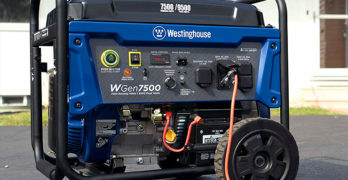 There’s no hassle to start the generator and if the battery runs flat, you have the option of using the recoil starter. The control panel on the Champion Power Equipment 75537i is well laid out with everything you need conveniently placed in one easy to access side panel. It has a TT-30R outlet, which is great for RV owners as it allows one connection for RVs fitted with this type of plug. There are two standard 120V outlets and a 12V outlet for charging batteries. USB adapters are supplied for the standard 12V connector plug. It also has an economy setting with a simple switch to activate the electronic fuel-saver mode. When running in economy mode, the engine revs will drop when the load demand isn’t too high. This not only saves fuel but also reduces noise levels. The Champion Power Equipment 75537i is a great looking machine and designed for maximum practicality and portability. It weighs only 96.6 LBS with two carry handles and wheels at the back to make it easy to move about. Dimensions are Height: 18.3”; Width: 17.3” and Length 25.1” so it’s very easy to transport. The compact design of this generator does limit the size of the fuel tank to 1.6 gal which gives a running time 8-hours at 25% load. Under normal operating conditions you’re probably looking at about 4-hours before the tank needs to be refilled. This is a wonderful generator, providing the best that modern technology has to offer, including the benefit of an inverter to protect your electronic equipment. The Champion Power Equipment 75537i has a 3-year warranty. This is the most powerful of the three inverter generators in this review and is also the only one that has the convenience of electric start and remote control. Where it falls short of the others is that it does not have the ability to use another generator in parallel. Consistently one of the top rated compact portable inverter generators. Ideal for a variety of applications, such as: Camping, hunting, tailgating and emergency power. Quiet operation is comparable to the sound level of a normal conversation. Limits total harmonic distortion to under 0.3% at no load and under 1.2% at full load. 51 dB at 25% load. Eco-Mode : Automatically adjust its fuel consumption. This is one of the most compact portable generators that you’ll find, and weighing around 50 LBs, it’s one of the lightest too. The WEN 56200i has an excellent inverter producing less than 1.2% THD under load (less 0.03% THD with no load). It is therefore perfect for powering even the most sensitive of electronic devices. The 79.7cc four-stroke OHV engine is exceptionally quiet with a noise level of only 51dB – less noise than an average room air conditioner. There are no worries about emission levels either with EPA III and carburetor certification. Despite being a very lightweight and economical inverter generator it has a good power output of 1600W running power and 2000W peak power. If you need extra power, for example for when you want to use it as a backup generator for your home, you can parallel this one with another WEN 56200i using the parallel connection ports. In order to do this, you’ll need to purchase an additional parallel kit. It doesn’t have electric start and therefore it can’t have a remote control either. Though the small engine is not difficult to start using the recoil starter and it has a very easy to use choke setting on the control panel. The 1-gallon fuel tank helps to keep the unit very compact and light but, of course, this limits the amount of run time that you’ll get. Thanks to the efficient engine and an economy setting, you’ll be able to get around 6 hours from a tank at 50% load. This is very good and under normal conditions, you’ll be running the generator at this type of load. The generator has two standard 120V output sockets with automatic overload shut down. It also has a 12V output and built-in 5V USB port for charging cell phones, tablets, and other USB devices. Selecting the economy mode is made easy with a switch on the control panel. Everything is on the control panel is designed for ease of use, with clear and simple markings. A sturdy carry handle at the top also makes it easy to carry the little machine around. Dimensions are Height: 19.25”; Width: 12” and Length: 22.25” making super easy to transport. The WEN 56200i is a fantastic inverter generator to supply clean power for your basic camping or other recreational needs. Contractors who want a small generator to run a few tools will also find this to be a very handy generator. If you require more power, you can make use of the parallel function and still have the benefit of a very portable unit. It has a 2-year warranty. 8-Hour Run Time at 25% Load. Packed with great features. Produces clean power for sensitive electronics such as laptops and gaming systems. H-handle design makes it easy to carry, or also allows two people to conveniently share the load. Lightweight design and quiet generator. Ideal backup power solution for tailgating, camping, outdoor recreation and emergency power. Your Pick of Outlet : A convenient control panel includes three outlets (one DC and two household) and a USB adapter, offering enough flexibility to power an extensive combination of lights, music, TVs, crock-pots, blenders, personal electronics and more. PowerSmart Series : Delivering 1,700 running watts and 2,200 starting watts. As a manufacturer of quality generators, Briggs and Stratton needs no introduction – they’ve been doing it for over 100 years. The Power Smart series is their latest development and uses the most advanced generator technology to date. This includes a true sine wave inverter and parallel functioning with any of the models in the Smart Power range. Using a 110cc OHV engine, the generator delivers 1700W of running power with a peak of 2200W. It can run in parallel with any of their Power Smart generators which includes the more power powerful P3000 to give enough power to run most household electrical appliances. It is a very quiet generator with a noise level of 59dB and also has an economy mode which enables the engine to adjust the revs according to power demand. The Briggs & Stratton P2200 is extremely compact, light and portable. It has an excellent handle design that makes it possible to carry it with two hands or one hand with an excellent handle position to provide perfect weight balance. It weighs only 54 LBS and measures Length: 21”; Height: 17.35” and Width: 12.5”. It has a spark arrestor and automatic low-oil shut-off for safety. It also has a fuel gauge and hour meter to help you monitor the fuel level and service intervals. The gas tank holds 1 gallon which gives you about 8 hours run time at 25%, this translates into about 4 hours for an average 50% load, which would be more like your normal operating load. There are 2 standard 120V outlets and a 12V outlet placed conveniently on the front panel along with the parallel ports (parallel kit sold separately) and gauges and warning lights. It doesn’t have an electric starter but uses a conventional recoil starter that is pretty easy to use. Anyone who is familiar with Briggs & Stratton generators will know that they are built to last and replacement parts, as well as agent backup service, should never be a problem. The Briggs & Stratton P2200 comes with a 2-year warranty (90 days for commercial use). It is very similar to the WEN 56200i with much of the same specifications and parallel connectivity, choosing between the two would probably be a matter of brand preference. Do you really need an inverter generator? We hope you now have an answer to the question : What is an inverter generator? But, now you need to figure out if you truly need an inverter generator? The advantage of parallel function for home users is that you can use one small generator for when you want a portable unit to take with you for camping or yachting trips. If you want more power to back up your home during power outages, there’s no need to buy a large generator that costs more and is more difficult to move around. You can simply add another small generator and run the two in parallel. If you want to use the generator for multiple functions, this will save you money and be more convenient. For contractors, a parallel inverter generator can be very beneficial. You may want something small and portable for a site where you don’t much power. If you have more than one team working on different sites, you’re going to need more than one generator. When you need extra power for larger jobs, you can simply use more than one generator together to provide a higher watt output. This versatility makes it more affordable to use more than one generator and allows for expansion as your business grows. In the end, whether it’s for domestic or commercial use, a parallel inverter generator gives you the advantage of versatility. You can use them for multiple purposes and you have the adaptability to allow for your changing needs.